Find more enterresting other games abcya. 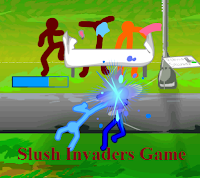 Description: Slush Invaders Game. Made: 2012. Dev Progress: 100% (Complete!) Type: Cannon Launcher. Controls: Click or #1-5 to send out fighters. QWE to switch targets.The invasion is awesome! Gather up your whole spectrum of rainbow colored heroes and take on the blue hued baddies one combo at a time!